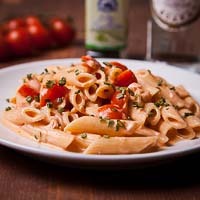 Joke aside, an evening once back home I decided to make what after turned to be a tweak to the famous so called in Italy “penne alla vodka”. Because I too forgot about this recipe it just happen to be that the bottle of vodka came out noticed awakening my memories. 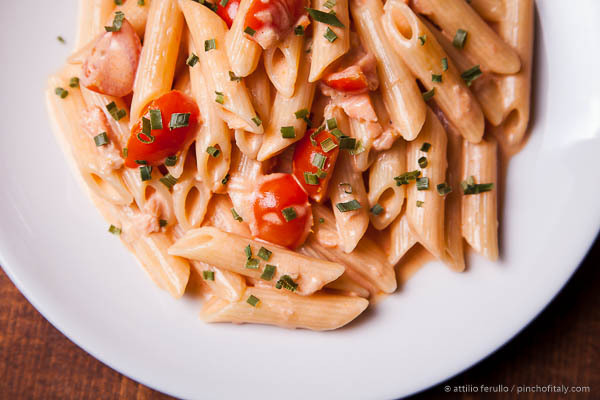 My 70s when I teenager used to gather with friends to enjoy a meal and penne with vodka sauce were one of those. 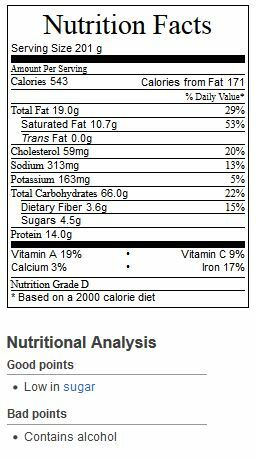 Today, many years later after a couple of attempts I got the correct ratios between ingredients making a good vodka taste flavorful rich for me. 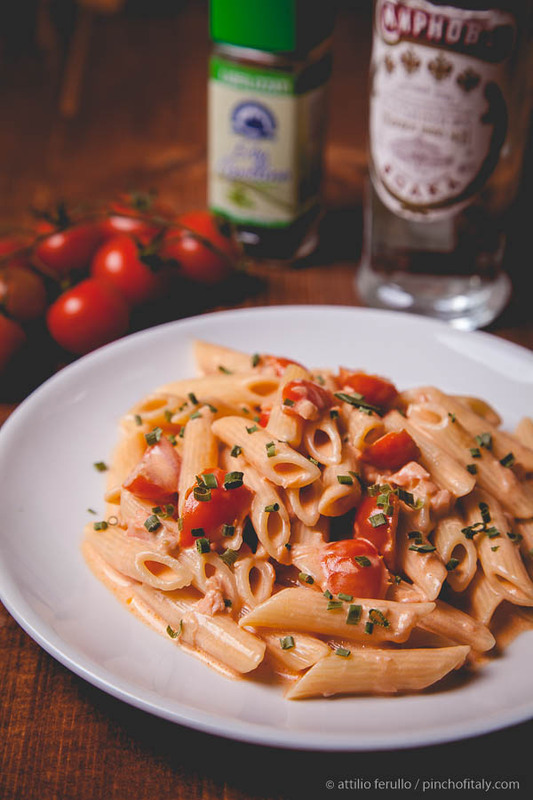 The pairing fell on vodka of course, smoked salmon and cherry tomatoes, I thought this would make a different vodka sauce with penne and a good one too. 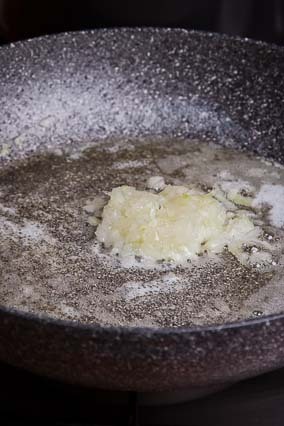 Finely chop the ¼ of onion and let it wither in the pan with the butter. 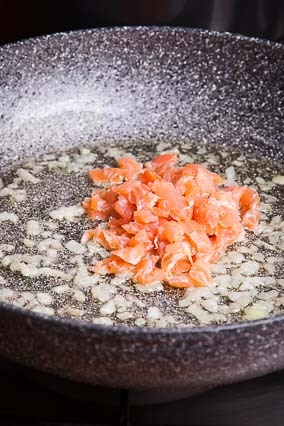 Reduce the smoked salmon into thin strips and add them to the onion and butter. Pour over the whole ½ cup of dry vodka and let it evaporate. 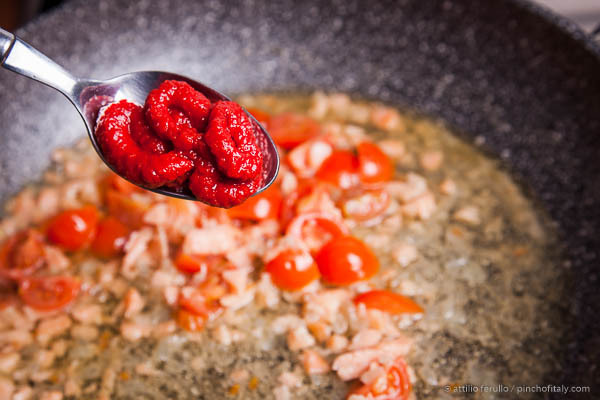 Cut each cherry tomato in quarters and saute briefly with the salmon. 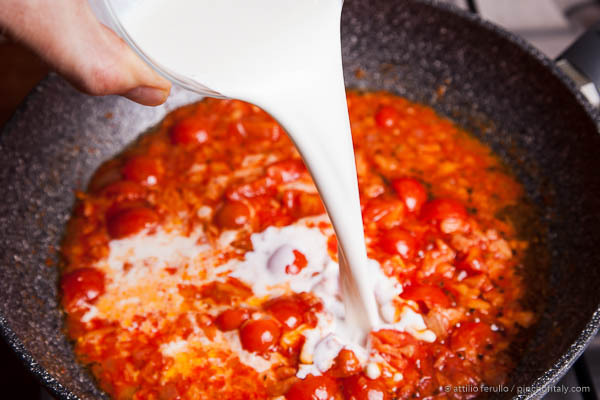 Add a spoon of tomato paste and finally add the fresh heavy cream. Turn off the heat and sprinkle the whole thing with a part of the chopped chives. 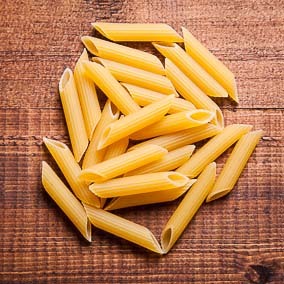 Cook the pasta al dente, drain it and move it to the pan with the freshly prepared sauce and serve hot with a last garnish of chopped chives. 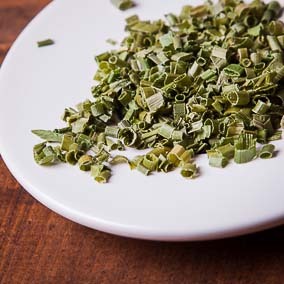 Ingredients are all common expect fresh chives depending on where you live, while freeze-dried chives can be found in small containers at a nearby grocery store. 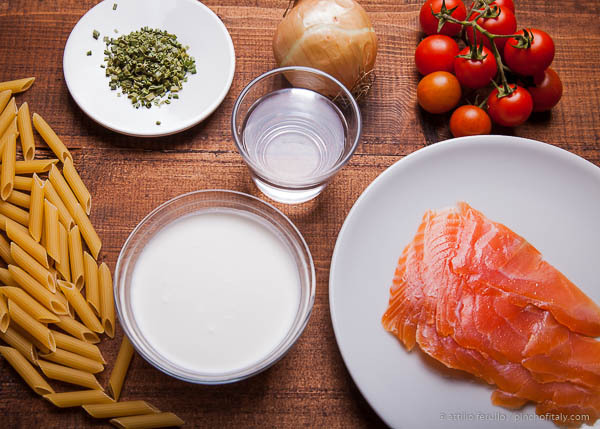 Just a little note here, as you seen within this vodka sauce recipe I never mentioned the salt and that's because the smoked salmon is already tasty, instead regularly add salt to pasta water while cooking. 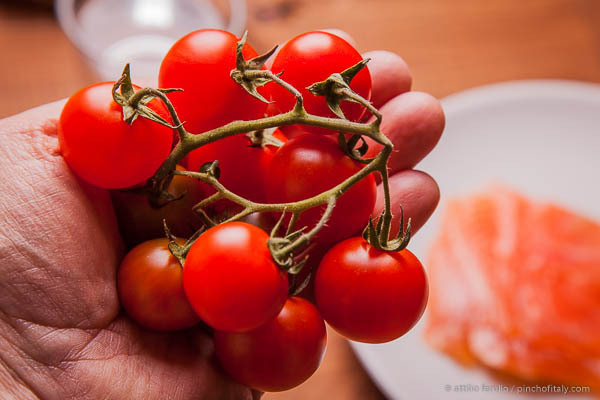 Pick up first the cherry tomatoes, wash them and cut them into quarters. 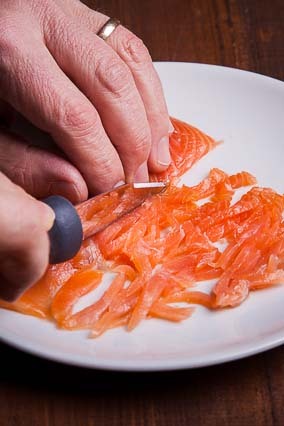 Then cut into thin strips the smoked salmon. Also a quarter of onion must be finely chopped so ready to be added to the pan were you previously melt 1 oz (30g) of butter. Now you can add the 1.8 oz (50g) of smoked salmon, give a stir and start cooking for about 2 minutes at medium heat until the salmon turns in a pale pink color. Add 1 cup (250 ml) of fresh heavy cream, stir until the mixture turns pink and well-blended. 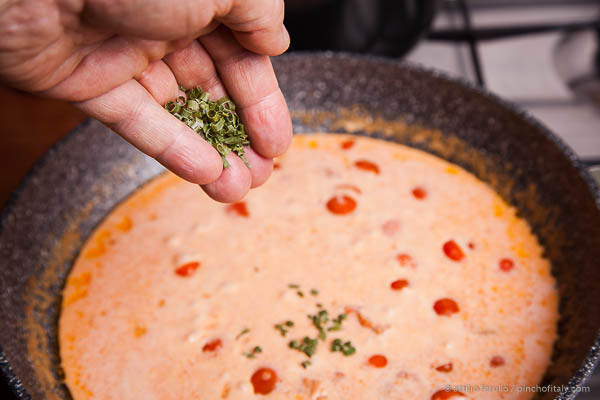 Just the quarters of cherry tomatoes will remain whole over the sauce. Sprinkle just a part of chives over the vodka sauce in the pan and keep some aside to sprinkle at the end over the finished plate. The sauce is ready and the penne must be ready too! Move the pan aside and cook the penne if you haven't yet (I usually prepare the sauce meanwhile the pasta cooks). 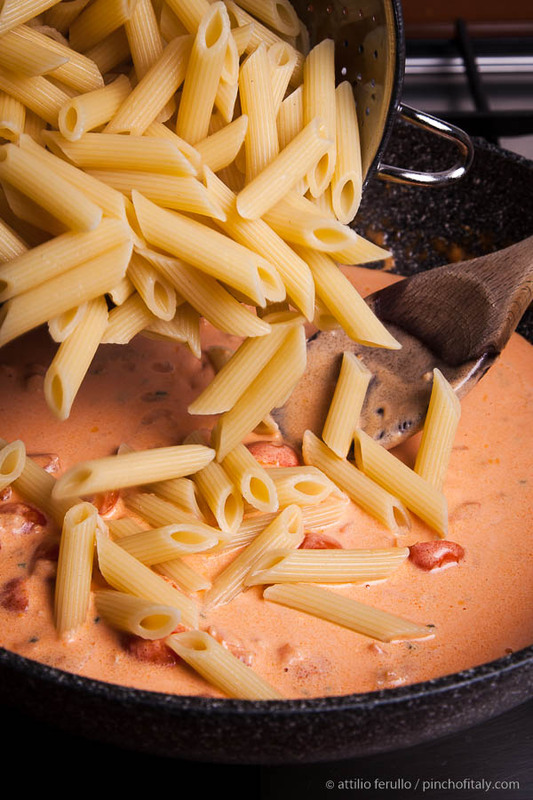 Once ready you can pour the penne in the warm pan and give a few stirs to mix the whole together. Here we are penne with vodka sauce are ready to be served with the last sprinkle of chopped chives for a further garnish. 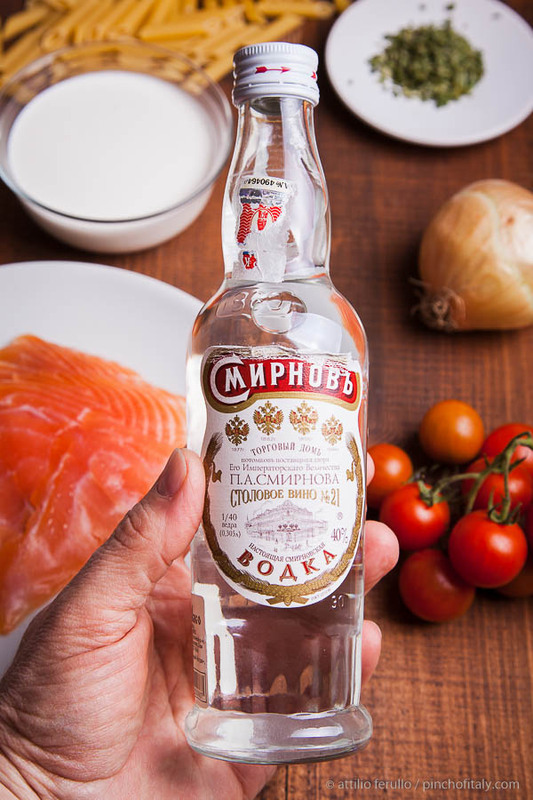 Take the glass or ½ cup (100 ml) of vodka and pour it over the mixture of onion and salmon, then bring in the quarters (4 oz 100g) of cherry tomatoes and give an extra stir. 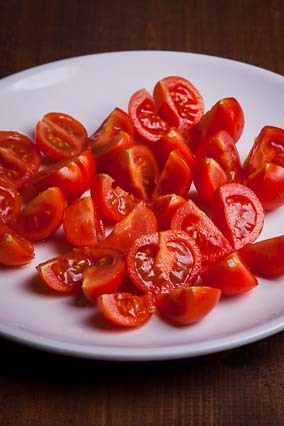 A spoon of tomato paste will give to the sauce taste and color too as the cherry tomatoes alone will not make it playing almost a garnish role once plated.